fietser.be: Yet another eWAW, and some lesser known WAW options. WAW375 was delivered to Erwin. 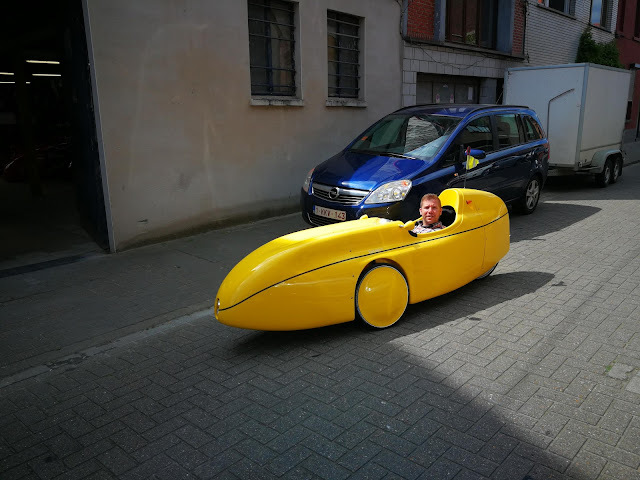 Fietser.be velomobile motor (torque sensing), Rohloff, air suspension of course. 100km daily commute. 2) Charging: Over the e-assist display you can see a USB charging port, drawing current from the motor battery. 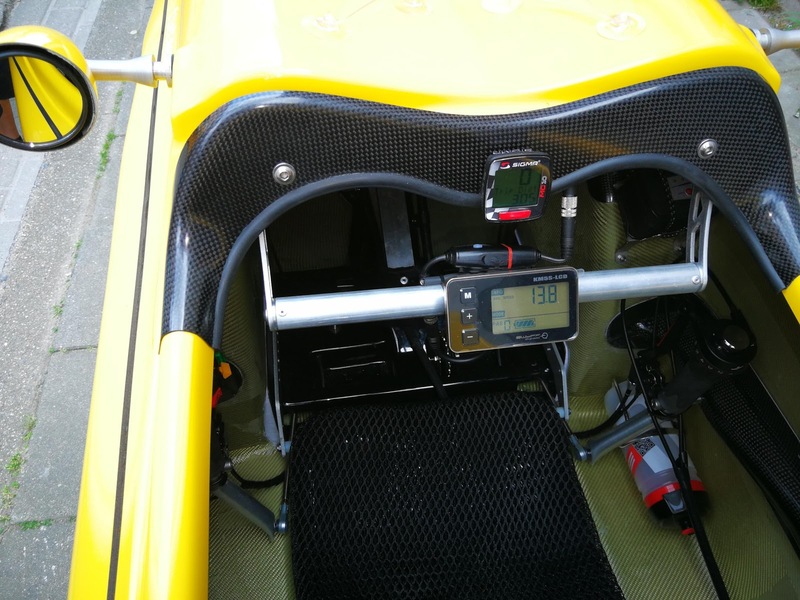 There's a second, double USB charger behind the dashboard, drawing from the 12V on-board battery. In this particular case we built a converter connecting the 36V motor batteries to the 12V on-board electricity circuit, so the customer has to plug in only one single charger every night. We decided long ago that the lighting should be independent from the presence of an e-assist (or battery) but in practice the eWAW motor and battery have become so good and lightweight that nobody ever considers riding unplugged anymore. The original 12V lighting battery remains on board as a backup. The new torque sensor motor is so economical that we have cut back the standard battery capacity to 400Wh, and downgraded from our fetish LiFePO4 batteries to the less powerful but more common li-ion batteries (Lithium Nickel Manganese Cobalt Oxide / LiNiMnCoO2). However this customer just has two batteries under the seat because of his 100 km, 5 days/week commute. 3) the chain lock eyelet in stainless steel. Sticking the chain through the rear wheel can get muddy \ annoying in the long run. 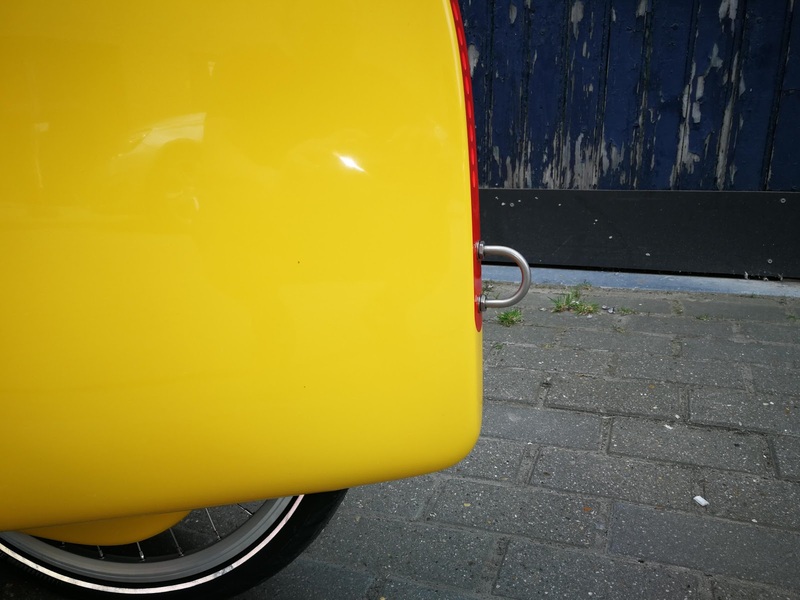 Note the refined rear reflector with CNC cut holes for the rear and brake light LEDs, another great job by Katanga.eu. 4) A new flag... 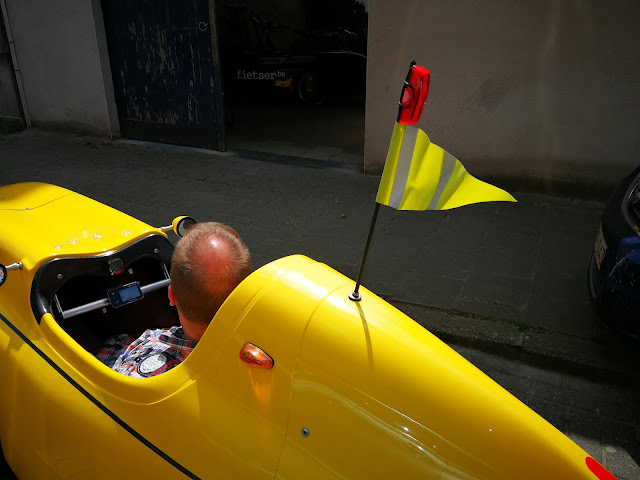 I know, I'm not a fan of flags (see the Velomobile FAQ) but this is actually a tough support for the amazing Kinetix X2 rear light with brake light that we 've become fond of. It's a stainless steel bar wrapped in rubber and suspended flexibly on rubber washers. The flag is only for social reasons, we hope it'll fall off soon by itself.